The AIM NetworkNews and PoliticsWho’s the real baby here, Mr Trump? Who’s the real baby here, Mr Trump? Who’s the real baby here? 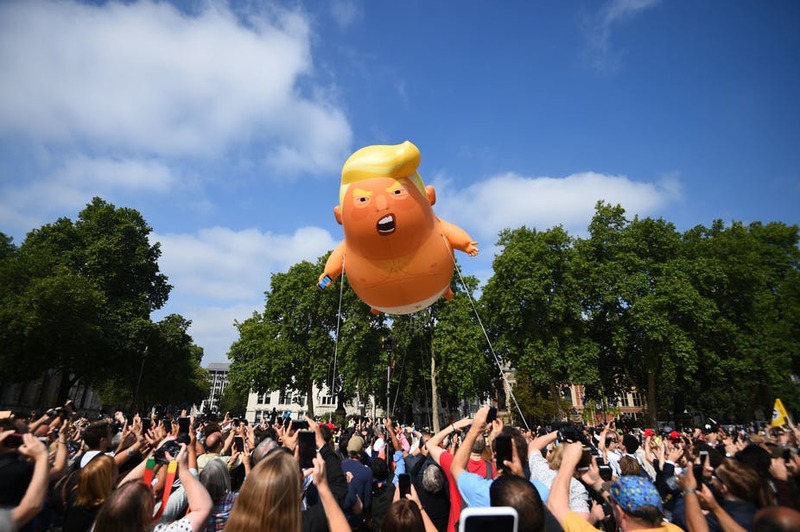 A monster orange balloon-effigy of Trump as an angry baby in a nappy, complete with blonde comb-over and blue mobile in tiny hand, scares him off London, Friday. It’s a brilliantly surreal representation, of the inner Trump which also evokes just how untethered this president is from his administration. Or from reality. Giving 100,000, “Together against Trump”, London protesters the slip, he elects to chow down with Theresa May, at Chequers, her grace and favour country residence, sixty-four km safely away in Aylesbury, Buckinghamshire. May displays a hearty appetite, despite the resignation of hard Brexiteer Boris Johnson, her foreign minister. He’s her ninth minister to resign in a year. Then Brexit Secretary, David Davis makes ten. Clearly, something is up. Steve Bannon, who sees a Trump-like quality in Johnson’s capacity to be dismissed as a clown, rates him a potential Prime Minister. Incredibly, not only does Trump barrack for Boris for PM also, this is widely seen as undermining Theresa May. By Friday, however, Johnson is back on the staff of The Daily Telegraph. May’s hospitality toward Trump is restrained. So much for the full state visit the British PM promised him in January 2017. Hot to trot, May jetted to the White House with an invitation from the Queen, seven days after Trump’s inauguration; the first world leader to visit monster baby. Perhaps it’s hyperbolic remorse. “I think Brexit’s going to be a wonderful thing for your country and I think it will be a tremendous asset, not a tremendous liability,” Donald, sagely predicted. So much for that. So much too, for Trump’s subsequent refusal to visit Blighty if there were large-scale protests. Monster baby soars above London; a bizarre barrage balloon. Large scale? There’s an unprecedented, massively popular, “dump Trump” protest in all major UK cities. May, herself, has alienated her party with her Brexit white paper, proposing an “association agreement”, an homage to the agreement the EU signed with Ukraine, a stroke of genius which could lose her control of her party. By week’s end, Scotland blows a raspberry at security and at The Donald. Police have yet to nab a paragliding Greenpeace protester who breaks through the “no-fly zone” surrounding Trump’s Turnberry golf resort, Friday evening. He’s as elusive as the small fortune Trump is losing on the venture. Or its source. Trump lost $36.1m on Turnberry in 2016, the last figure available. The Washington Post is looking into $400,000 in cash which Trump plunged into acquisitions, including $65m to buy Turnberry, between 2006 and 2015. Eric Trump has reassured everyone, however, by volunteering that much of Turnberry’s funding came from Russia. Floating past the US president, a notorious golf-cheat, as he enters the Scottish hotel; flaunting himself in front of rows of police snipers, the protestor trails a canary yellow banner with the legend “Trump: well below par #resist”. Police go ballistic with all the latest anti-terror, counter terror, dissent repressing and all the other top secret security routines that cannot be divulged for operational reasons – measures which are so popular in our own nation that we blithely surrender our rights to the very “way of life” we are trying to protect. Freedom of the press, a right supported by the Australian Human Rights Commission and The Australian Press Council is increasingly eroded or curtailed. Anxious not to be wedged, Labor supports the Coalition’s latest espionage bill and its foreign transparency register. The former could criminalise protests and criticism of government, according to legal advice, obtained by Get Up. Would a monster baby Trump survive in our skies? Our pro-Trump commercial media and our cowed, under-funded, government-bastardised ABC, about to endure an efficiency review, would have us believe that the Donald, who watches up to eight hours’ TV a day, won’t see the protests. The mainstream narrative normalises the monster as much as it insults its audience’s common sense. Some of the more coherent, authentic local Trumpistas are wheeled out, at week’s end to rave over him. On ABC Insiders Sunday, Gerard Henderson, pronounces Trump’s diplomatic mission as “largely successful”. He just loves Trump’s pep talk to NATO, a US-led containment strategy dating from 1949. Trump threatens to pull out the alliance. Rich NATO countries are not paying their fair share, he raves. The next day, however, Trump holds a conference praising NATO. He spends more time spruiking his own success in getting members to increase their budgets and commitments, but he won’t specify by how much. It’s another outright lie. There has been no such increase. Nor is the US being dudded. Although the US pays only 22% of the cost of maintaining NATO, leaving Germany (14.65 percent), France (10.63%) and Britain (9.84 %) – and thirteen allies; mostly smaller, vastly poorer, former communist countries roped into the alliance after the fall of the USSR and disintegration of Yugoslavia, who pay less than one percent each. Zut! French President Emmanuel Macron confirms no-one has agreed to any figure higher than what was in the leaders’ communique — 2 per cent by 2024 — a leaders’ statement that Donald Trump had signed the day before. Gerard Henderson could, of course, be ahead of the game. Perhaps he’s referring to his idol’s business successes – or, at least, he may be impressed at how many infomercials and business trips Trump works into his gruelling presidential schedule. Trump’s Turnberry tour of duty is the 169th day during his presidency that he has visited a property owned, managed or branded by The Trump Organisation, writes Katie Rogers in The New York Times. Then again, merry Gerry could have been charmed by the President’s slap-down of Angela Merkel who was also chuffed to hear that Germany was “captive to Russia” because of its dependence on Russian natural gas. Of course, Trump will watch TV coverage of his favourite subject, himself. But that’s not even the main point of Trump Baby, its creator, environmental activist, Leo Murray, explains, claiming (mostly) loftier aspirations. Britain’s PM must grin and bear Trump’s humiliation of her in the Murdoch press. The Donald, a self-proclaimed stable genius, says May failed to take his advice on Brexit and she’s about to kill any special UK-US trade deal. Boris would make a great Prime Minister, he adds, but he clears all that up by explaining that it’s fake news and that May is “an incredible woman doing an incredible job” and The Sun just left out all the good stuff, he says. Advice? By Sunday, May reveals on BBC TV’s, The Andrew Marr Show, that Trump suggests she sue the EU. May publicly declines the US president’s advice. She will, instead, be negotiating with the EU, she says pointedly. Insecure? Trump shouts down CNN’s reporter; calls CNN “fake news.” He bags NBC News for “such dishonest reporting.” The Donald falsely accuses London’s The Sun of cherry-picking quotes from an interview; complains about a New York Times image that, he says, makes it look like he has a “double chin.” He acts like a big baby. Or anti-baby? Most babies like to breast-feed. The New York Times reports, last Sunday, that the US confounds world health experts by heavying other nations to block a UN resolution promoting breastfeeding. Monster baby Trump, evokes babies of “illegal” migrants in cages. Our government tends to play along with The Donald’s random acts of cruelty. Only Peter Dutton matches Trump’s mob when it comes to souring the milk of human kindness. Now even the human breast is suspect. The US defies long-standing scientific consensus that breast milk is ultimately healthier for children than infant formula, (although not all parents can breastfeed). Breast-milk is not only safer, it’s cheaper. “The deaths of 823,000 children and 20,000 mothers each year could be averted through universal breastfeeding, along with economic savings of US $300 billion,” a 2016 study found. Yet breast-feeding threatens the profits of multinational corporations who produce infant formula in a US $70bn industry dominated by a few giant US and Europe-based multinational firms. Even after Trump’s tax breaks, they may fail to thrive should mothers put their babies on the breast. Six major international companies and their subsidiaries control the market: Nestle leads with 22% of the global market share, Danone, Mead Johnson (now RB), Abbott, Friesland Campina, and Heinz. It’s a tribute to the power of oligarchical, multi-national capitalism. Its brilliant success mirrors the fabulous benefits we enjoy as a result of having privatised so many essential services such as electric power or the provision of jobs or disability services. Trump’s concern parallels our own business-friendly government’s solicitude; its crusade to help out needy corporations with tax cuts, especially the ten companies who have written an open letter urging the senate to pass the last tranche of the legislation even if half of them didn’t pay any company tax in 2015-16. Amazing news gladdens the hearts of all Australians as Rod Sims, head of the Australian Consumer and Competition Commission, (ACCC), commonly billed as our “competition watchdog” announces it has solved the mystery of why our nation’s electricity is the most expensive in the world. Retail competition is a failure. It’s taken just over a year for the ACCC to make its statement of the bleeding obvious. Yet now it is overnight the expert du jour on setting energy policy. Already there’s the Australian Energy Market Commission, (AEMC), The Australian Energy Regulator (AER), Australian Energy Market Operator, (AEMO) and Energy Security Board (ESB), an alphabet soup of acronyms to set energy policy – helped of course by various state government bureaucrats. The AEMC’s rules have pushed electricity prices unnecessarily high. One rule gave the grid companies a guaranteed mark-up on capital outlays, rewarding them for gold plating the network. Another rule let wholesale suppliers enjoy ridiculously high prices by “gaming” the government-created National Electricity Market (NEM). “Hot days are the greatest challenge for our electricity system and especially for gas and coal-fired generators. Our system now struggles to meet peak demand without rooftop solar and other renewables,” says Ben Oquist, Executive Director of The Australia Institute. Immediately, however, the blind men and the elephant (in the room) that is the Turnbull government energy and environment committee claim that the ACCC calls for government-subsidised new coal-fired power stations. It doesn’t. Time for someone to produce a balloon barrage of Craig Kelly, Matthew Canavan, Tony Abbott, Barnaby Joyce and co. If time is short, a flying Frydenberg or a michelin man Malcolm Turnbull would do. These babies could be deployed whenever and wherever the nation’s citizens are brave enough to risk prosecution by protesting at having been exploited for decades; robbed blind by an electricity system that is built for profits and not fit for purpose. Our electricity system will not be fixed by the NEG, the ACCC or any other dodgy acronym, authority, board or quango that permits further environmental destruction under the hoax of being “technology neutral” or “agnostic” as a ruse to allow coal-fired power stations to continue to cause global warming, destroying the planet and poisoning the very air we breathe. Depressingly well written. One to be filed away for future reference. Hard to believe the American idiot was first decried in 2004. As it turns out, Bush was only the beta model. What a difference a decade makes. Isn’t that going well for us? It is of passing curiosity that the worth of T-Rump is a matter of speculation. He insists his commercial value is his ‘brand’, as his companies don’t own a lot of bricks and mortar, mostly just licensing agreements for the T-Rump name. A bit like our very own immigrant made good, Dennis Gowing. Both traded on their notoriety rather than their ‘good reputation’. That is why the Forbes people and T-Rump have a disparity on T-Rump’s value. He reckons his name is worth billions. At least T-Rump recognises the value of the media. On departing the EU, after days of his ‘hand grenade’ press interviews, described by a sycophantic media as ‘diplomacy a-la T-Rump’, he describes the EU (and, by default, NATO?) as the “biggest foe globally”, ahead of North Korea, China, Iran, etc. He’s off to see his great friend, Russia’s Rising Tsar, Putin, where they will talk about all things T-Rump, like getting his business brand up and running in downtown St Petersburg. At least they won’t be talking about the rights of the gay and lesbian communities. Putin is a well known overt denier of their rights, notwithstanding protests during the World Cup, whilst T-Rump is a covert denier, being too gutless for anything other than subterfuge through an increasingly skewed Supreme Court. As for his thriving golf courses, The Trump International Golf Links Doonbeg are in this odd space, somewhere between precedent and premonition, somewhere between metaphor and analogy. Not because its been losing money for years. But because of the wall he wanted to build – pre Mexico! – and the reason. It seems he DOES believe in climate change when it effects his investments. Not surprisingly, the last decision in December, 2017, allowed for a wall to be built but of a lesser height than requested. Journalists have been seeking confirmation that he has sent the invoice to the Mexican government. As for Baby T-Rump, the Scottish experience in protest has a rich history. One protestor wants T-Rump held up as an example to three year olds everywhere. Another protestor wants to highlight T-Rump as a model for disciplining children. As for the other T-Rump, the gas filled effigy that could well serve as a security doppelgänger (given its overinflation), it is soon to start a world tour. Will Oz jump on the T-Rump protest band-wagon? Putting aside the vagaries of our governments chaotic energy ‘policy’, it is interesting to note the protests over this weekend in little old Oz. Remember when our truckies (Lindsay Fox and his little mates) went on strike? Remember when the Wizard of Oz and his megaphone, Princess Cash, took to the streets to champion ‘the Cause’ of the little Aussie battler – Lindsay Fox – the abolition of the evil, wicked RSRT? The same protests occurred over the weekend wanting the reintroduction of the RSRT or a similar body. There was no sign of the little Aussie battler, Fox, let alone the Wizard of Oz or Princess Cash in the most recent protests. Go figure. There is much said about the acquiescent, ignorant, apathetic Aussie who doesn’t protest. A bit like the 100,000 who took to Melbourne’s streets to protest all manner of inequities in the workplace. Ah well, if we don’t report it or remember it, it never happened, right? It’s as if the illegal wages regime (underpayment, non-payment, abuse, etc without legal remedy) really doesn’t affect us at all, unless we’re trying to pay a power bill. Will Aussies take to the streets to greet the Baby T-Rump (the overinflated, gas filled, nappy clothed (or is it the refashioned toga of an impotent fiddler, playing to the sound of his burning Roam?) doppelgänger with the bad comb-over) as he alights from ‘The Beast’? Or will they celebrate the arrival of the Effigy? Thank you Mr Tyler. Your writing is one of the few good things to be anticipated on a Monday. PS. The ‘Wonderful Wizard of Oz’ is currently touring Oz. In the interests of creating an ‘efficiency dividend’, perhaps they should have auditioned Malcolm Bligh Turnbull. Think about it. He encapsulates three of the major parts – the Scarecrow (who wants a brain), the Tin Woodman (who desires a heart), and the Cowardly Lion (who is in need of courage). Had he been cast in the parts, which his real life experience tells us he is eminently qualified for, the production company would have been saved two salaries (efficiency dividend #1) and we would have been spared his more public iteration (efficiency dividend #2). One American commentator noted this morning that the Trump/Putin head to head meeting with no advisers present would mean that there would only be one adult (excluding interpreters) present. Tune in to FoxNews to find out who the adult is ! Thank you David and Kyran. Trump’s tweets show the type of man he is…. It’s all about him. Perhaps he’ll get some tips from Vlad about how to quell “dissension”. The Donald is jealous of Jong-Un and Putin because they are established authoritarian dictators and he’s just a tyro dictator who is more than a little out of his tree insane unlike Putin and Jong-Un. The self-promoting “deal-maker” to meet with the arch-manipulator. Trump will declare the meeting a great success for the entire world – his “low expectations” merely being the cover before revealing another Trump “victory”. Putin will continue to get Trump to do all his work for him. It was very refreshing to get a different perspective from the recent conference organized by the Schiller Institute and the successful meeting in Singapore with president Kim from North Korea. Maybe we do have an alternative to the Anglo-American-Vatican limits to growth and population reduction paradigm? The intelligence community in the US may not be angels but they do seem to have evidence on their side, in contrast to the ‘weapons of mass destruction’ scandal. In this case reputable geostrategists ie not spies do support the evidence adduced. Thank you David and Kyran for your informed views … so many points to ponder. “Freedom of the press”?????? This vanished in Australia when successive governments allowed News Ltd to purchase any and almost every masthead in the country. Now it is time to restrict ownership of re-newing media licences to natural persons only holding single Australian citizenship or corporations having a 70% shareholding of natural persons of sole Australian citizenship. The advantages to governments of selling off power generators is that more bureaucratic jobs are created in government quangoes where access to government expense accounts is a perk of the protected job.